From hand fans to candy jars, bottle openers and sunglasses, Beau Coup has a ton of affordable wedding favors that can be personalized for the couple and the event. They also have playing cards, hangover kits and all manner of adorable take-homes and ways to say thank you to your guests and encourage them to have a great time. Prices start as low as $1 for magnets and candy bags, and even the most expensive favor options were under $4 each. Prices for personalized cups start at $45 for a set of 25, and $120 for a set of 100 personalized coasters. A living plant is a meaningful and apt favor for an outdoor or nature-inspired wedding. But don't feel limited by your theme. Eastern Leaf has small olive trees, rosemary, air plants, lucky bamboo and other live favors that, when your guests take them home and care for them, will alway remind them of your special day. They work great as seating card anchors or you can display them on a table for guests to pick up on the way out. Prices for air plants start at about $3 each and go up to about $10 each for a small planted bonsai favor. It should come as no surprise that digital wedding hub The Knot is an excellent resource for classy, thoughtful wedding favor ideas, all in one place. From a vintage-inspired compass to shell-shaped salt and pepper shakers, matchbooks and customized glassware—they've got it. Matchboxes start at $1 each, coasters go as low as $0.30 each, while a salt and pepper set will run you about $4 each, but comes in a personalized gift box, too. The Wedding Outlet offers a huge variety of fairly basic wedding favor options, including golf balls, hand fans, flip-flops, sunglasses and more, all of which are relatively affordable. (A set of 6 pairs of flip flops will run you about $45, though.) One of our favorite finds—that's perfect for a destination wedding or a true "party" celebration—is a personalized cocktail shaker and margarita mix. They are priced as low as $3.50 each if you order more than 144, but don't exceed $4 each. Are you the DIY type? Check out Party City for tons of container options—from glass jars to canvas bags, whimsical boxes and party bags. From there it's up to you to fill them, which gives you a lot of room to be highly personal or creative or just keep it simple. Glass jars with cork lids start at $16.50 for 12 count, while clear plastic heart-shaped boxes (to fill with candy or IB profen, up to you!) start at $15 for 24 boxes. For example, Custom Ink can put your special design on just about anything including tin camping mugs, tote bags, headphones, power banks, fleece blankets... The list goes on! Prices vary widely based on what item you choose and how many you order, but something like a custom mug will start at about $7 each when you order 100. *These custom wedding mugs were shot by Darling Juliet photography. Oriental Trading has launched it's own wedding favor website, perfect for couples looking for playful and affordable favors for their wedding. Poker chips with a photo of you two in the middle? Got em. Individual microwave popcorn bags that read, "Our love is poppin'?" Absolutely. Guitar pics, pencils, cookie cutters... We could go on. For couples who aren't taking their wedding too seriously, this is a great resource. 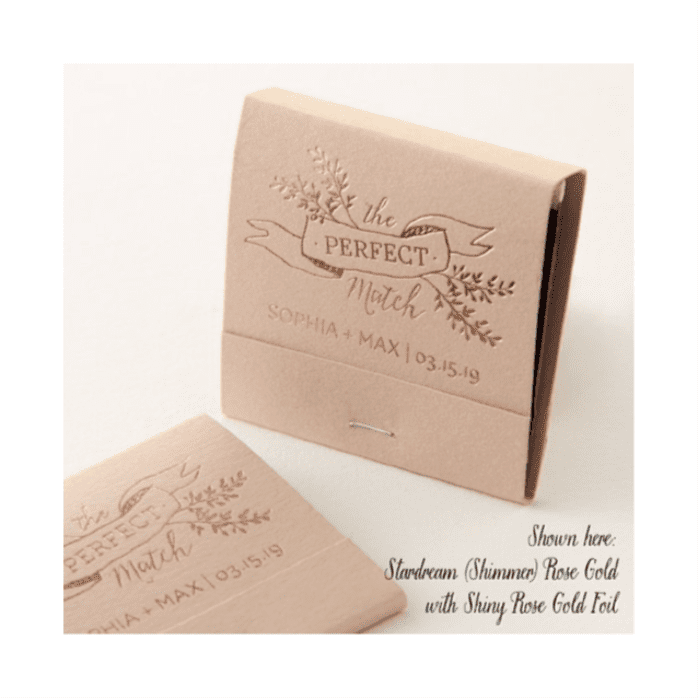 If your idea for wedding favors is something fun and chic but ultimately disposable, check out the paper goods, drink vessels, boxes bags and matchbooks from For Your Party. Along with custom individual products, they also have a variety of bundles available so you can combine glasses, napkins and a wine bottle tag with the same design. Wedding matchbooks start at about $38 for 50, and frosted personalized plastic cups start at $120 for 50.